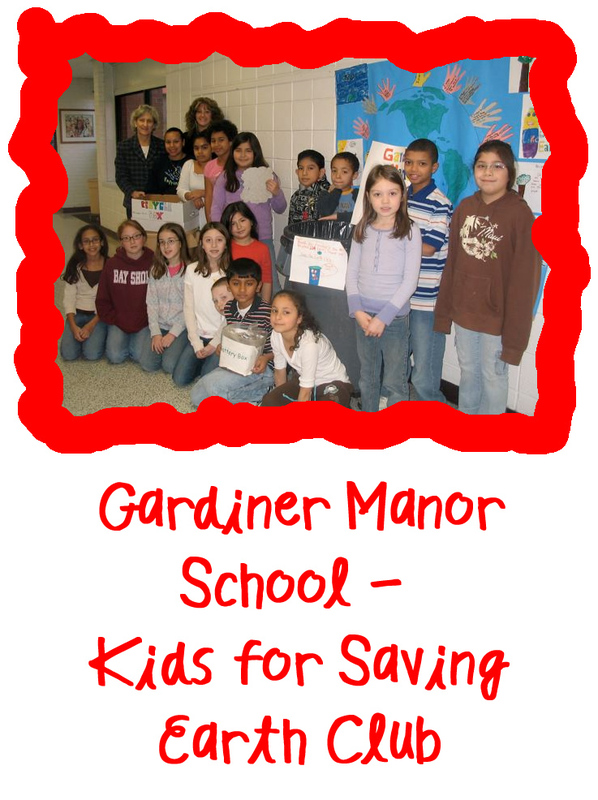 This is the Gardiner Manor School – Kids for Saving the Earth Club in Bay Shore, New York. Every year our club members recycle paper in the school. Each week we collect an average of 280 lbs of paper from classrooms and bundle it up for recycling. Over the last five years, with help from the Town of Islip, we have been able to keep 11,700 batteries out of the landfills of Long Island. The Town of Islip also helped us to send 110 pairs of old sneakers to Nike for the Reuse-a-shoe Program. And we are very proud to say that our refundable can collection has earned us enough money to adopt an acre of Rain Forest. We don’t spend all our time collecting recyclables. Before the holidays we gathered together to make crafts, from recyclable materials of course, to sell at our holiday boutique. We even made our own recycled paper and turned them into fancy bookmarks. These were very big sellers. The proceeds from our sale went to adopting an endangered animal. After much debate we decided on the kit fox. We are proud to be Defenders of the Earth!!! !